At Computex 2017, AMD showed the world its upcoming product releases. From Ryzen Mobile APUs, EPYC server CPUs, laptops and desktops from OEM partners, and surprise announcements for Threadripper’s 64 PCIe lanes and RX Vega launch date. The next couple of months are going to be busy! It’s AMD’s turn for press releases here at Computex, and a number of important updates about the future of certain product lines were addressed, the big news being centered around Threadripper and RX Vega. Details are still being ironed out, but most of the important stuff, like launch dates, were revealed. The event started off with warm handshakes and a love for PC gaming, with a number of announcements from AMD’s partners regarding upcoming product releases centered around the Ryzen launch and RX 580 graphics. Two of particular interest being a Dell all-in-one and a new ASUS ROG GL702CZ laptop powered by a Ryzen 7 CPU, and RX 580 graphics powering a FreeSync display. The laptop is of interest because ASUS itself said it’s the most power laptop on the market, at least by the CPU, being 60% faster than the next offering (which isn’t hard to believe considering most laptops are quad-core CPUs). More details about the laptop should be revealed later. 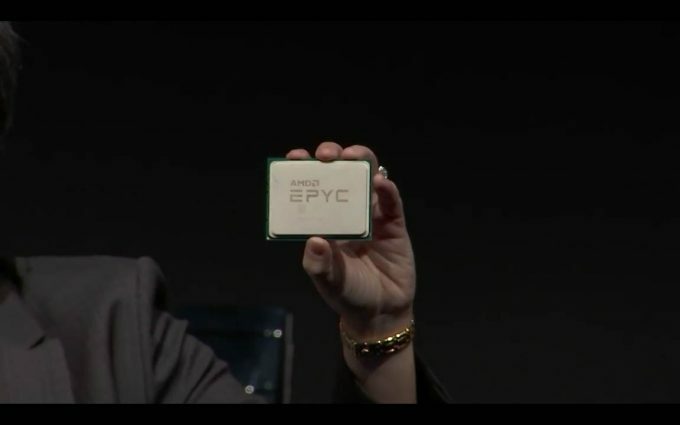 AMD’s server segment was brief, reaffirming what we already knew about its EPYC product line of 32-core CPUs that we expect to launch in the coming months. EPYC was previously codenamed Naples, and it has a lot to offer the server market, mainly centered around its 8-channel memory and huge I/O support. 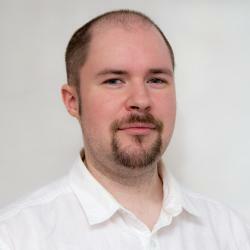 It’s scheduled to launch officially June 20th this year, and looks to be a real challenger in the server domain. 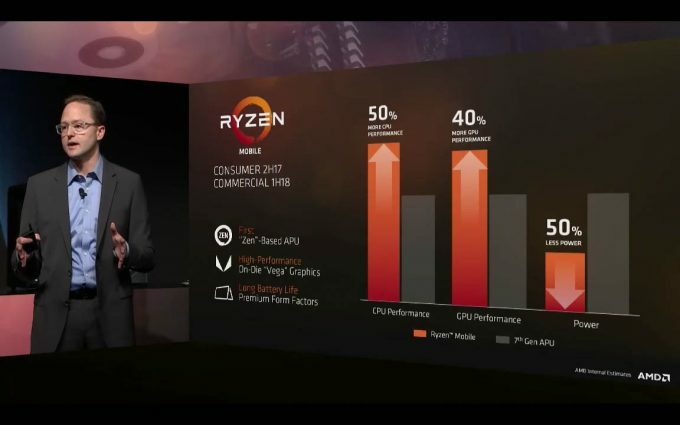 While lacking any real hard numbers, the Ryzen Mobile segment confirmed expectation and rumors about its APU range, namely that we should start to see ultra-portable reference designs coming out soon. 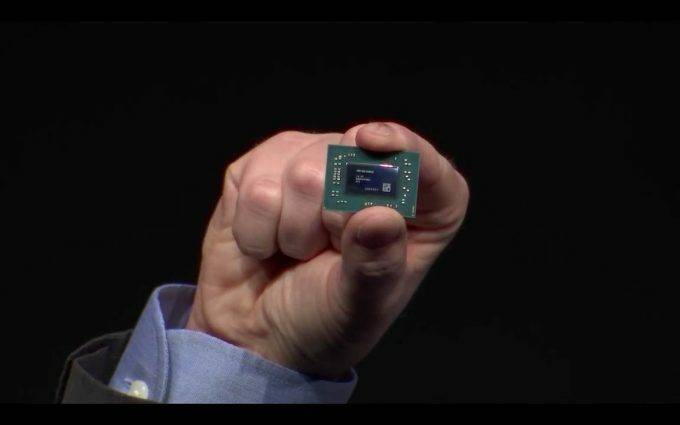 It’s still early days for the chip, as only a reference convertible built by AMD was shown, but it featured a 4-core 8-thread CPU with Vega GPU architecture (not Polaris), combined into a single APU. 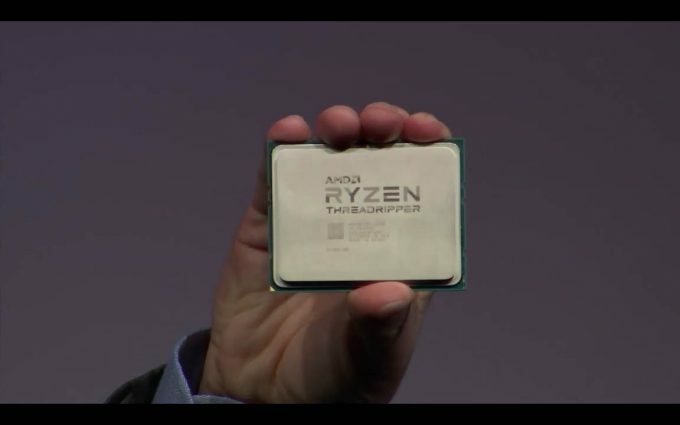 Of course, the real steal of the show was from the two big guns that AMD has been cooking up for a while. This is AMD’s entry into the high-end desktop (HEDT) market with its new Threadripper CPU range. These CPUs are specifically targeted at Intel’s previous Extreme series CPUs, which have since been re-branded as the X-Series. 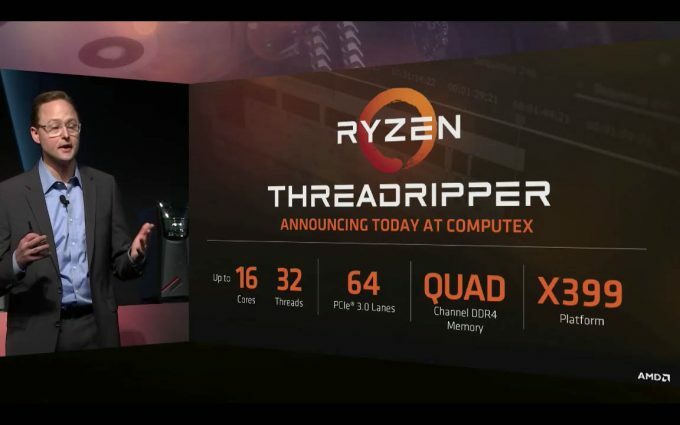 Most of what was known officially about Threadripper was confirmed, with the release of 16-core 32-thread CPUs being the headline chips, running on a new X399 chipset platform, using a new socket called TR4 rather than the AM4 for Ryzen. Also, these chips are huge. However, there was one detail that people were not expecting, and something that, from what we could tell, even caught AMD execs by surprise with the reaction; the surprise announcement that Threadripper will have 64 PCIe lanes made available to it, across all of its CPUs. To put that into perspective, Intel’s latest X-series CPUs only have 44 lanes, and only in the top-tier chips, the rest are 28 or 16 lanes. To demonstrate this connectivity, a quick demo was shown with a Threadripper system using not just two RX Vega GPUs to play Prey, but also show four Radeon Vega Frontier Edition GPUs being put to work in Blender with the Radeon ProRender plugin (similar in principle to NVIDIA’s Iray system of iterative ray tracing). Threadripper will likely see a lot of use with high-performance PCIe-based NVMe SSDs and compute workloads with all those lanes, but maybe Thunderbolt 3 supprot too, since Intel recently opened up the platform there (this will be down to motherboard vendors though). The one announcement that needs to be addressed is the final push for the Vega GPU series. Not long ago, AMD said that the first Vega-based GPU coming to the market will be the Radeon Vega Frontier Edition, or Vega FE from now on. This is the compute and professional version of the card, designed for creative professionals and research. This will be released very soon, June 27th to be precise, or just after EPYC launches. Vega FE will be expensive though, and not the gaming card that people have been clamoring for, for well over a year now. However, there is now a silver lining, as we now have a confirmed release date for Radeon RX Vega, the gaming counterpart to the Vega FE. RX Vega will be launched at SIGGRAPH at the end of July. So there you have people, stay tuned for SIGGRAPH, as we’ll finally get to see RX Vega for the first time, not to mention EPYC and possible Threadripper launches over the coming months.